One of the chapters, for example, answers which race Kevin Costner was able to white savior the best, because did you know that he white saviors Mexicans in McFarland, USA, and white saviors Native Americans in Dances with Wolves, and white saviors Black people in Black or White, and white saviors the Cleveland Browns in Draft Day? Another of the chapters, for a second example, answers what other high school movie characters would be in Regina George's circle of friends if we opened up the Mean Girls universe to include other movies (Johnny Lawrence is temporarily in, Claire from The Breakfast Club is in, Ferris Bueller is out, Isis from Bring It On is out...). Another of the chapters, for a third example, creates a special version of the Academy Awards specifically for rom-coms, the most underrated movie genre of all. And another of the chapters, for a final example, is actually a triple chapter that serves as an NBA-style draft of the very best and most memorable moments in gangster movies. 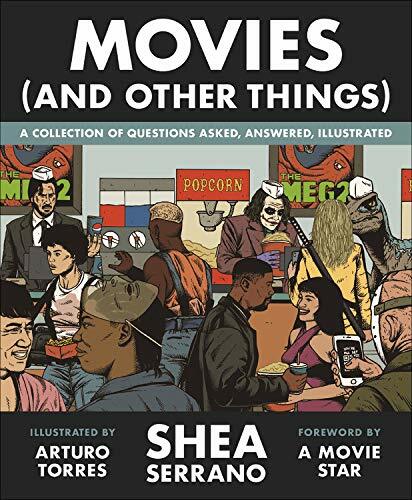 Many, many things happen in Movies (And Other Things), some of which funny, others of which are sad, a few of which are insightful, and all of which are handled with the type of care and dedication to the smallest details and pockets of pop culture that only a book by Shea Serrano can provide.